France Tourisme offers you exclusively its adaptable at will double-decker bus ! A modern and innovating concept for this bus which revisits the double-decker bus of yesteryear, but with a translucent sunroof, opened or not, as you want in only few minutes, with a heating system at the superior floor, and a modern and original design. Individual Audio guides in 9 languages, for the standard tours : french, english, spanish, portuguese, japanese, russian, german, italian, chinese. 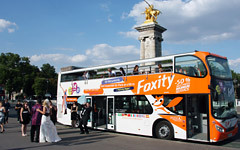 For all your events, France Tourism offers you a double Decker bus privatized and decorated suit your image. In full or partial covering, we adapt to your specialty needs and the realization of the stickers. The bus will be an exclusive use for a city tour for group, a transfer or any other service as per your request. Services at best prices ! • Our regular offer is really complete, for night or day, for a regular or a custom-made tour during a day. You can enjoy this servicies with a reduced price according to the number of persons in the group. 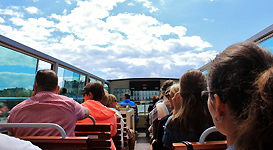 • Personalized tours in Paris can be adjusted to the time you have (2 hours, half day, entire day or more), pick up and drop off points can be chosen according to your needs, but the tours are always studied in advance in order to get on and off the bus in total security. • The Groups and custom-made service is at your entire disposal to create with you an original way to discover the great historical sites or monuments of the Paris area. • If you travel with a big group, the double-decker bus is the ideal mean of transport ! It is both entertaining and panoramic and it can accomodate until 74 people together ! • We propose the renting of our double-decker bus for Weddings, Anniversaries, bachelor and bachelorette parties.